It’s not hard to understand why so many adventure stories are about teenagers. Teens are at that inquisitive and transitional time in their lives where every decision feels weighted, like their entire universe will change with each choice—or perhaps that none of their decisions matter and nothing will ever change. Teenagers are dramatic. They’re hyperbolic. They’re intensely self-aware as their bodies, minds, and social interactions are constantly evolving. Teenagers are the perfect vehicle for audiences experiencing new worlds and new adventures. The team behind Life Is Strange clearly remember what being a teenager feels like. Not in the “these are the best days of your life” way adults seem to always talk about, nor in the rule-breaking sexed-up bacchanalia TV and movies so often depict. Life Is Strange presents adolescent life much more the way I remember it being, with constant self-examination and second-guessing, a hyper-awareness of the ever-changing world around you, and a desire to change everything hampered by your own suffocating surroundings. Life Is Strange is an episodic game starring Maxine Caulfield, a senior at an Oregon boarding school with a lifelong love of analog photography. In this first installment of her week-long adventure, Max discovers her special ability to rewind the past few minutes of her life in order to make different decisions, reconnects with an old friend, and has a vision of the catastrophic disaster that threatens to end her entire world. That mild time-traveling system is certainly what makes Life Is Strange stand apart from similar adventure games. It provides players the opportunity to witness several outcomes of the same interaction before deciding which to stick with. Precious few of Max’s decisions make an immediate difference in her life on this first day, but there’s no telling how vandalizing a classmate’s dorm room or breaking a snow globe will affect the events of day three or four (in the game’s coming installments). No longer are players bound to the autocratic “Oh no, you didn’t press X early enough so now that guy’s dead” plot points. At every major juncture, Max can change her mind and do it all over again, so the final results will be a direct product of her decisions rather than her lack thereof. It’s akin to reading a Choose Your Own Adventure book and paging ahead to see which direction you prefer. Rewinding isn’t a catch-all cheat for the game, though. It’s not enough for the player to know the answer to a problem if Max doesn’t know the answer herself. Several puzzles require Max to screw up first in order to recognize what she could have done differently and then rewinding, like when she doesn’t know the answer to her photography teacher’s question in class. Only after being embarrassed by another student’s showing off can Max rewind and flaunt her newfound familiarity with the work of Louis Daguerre. This first chapter, “Chrysalis,” is largely an introduction to the time travel and central characters. Not a whole lot happens, but that feels appropriate for the type of game promised here. It’s hard to make decisions without context, and so this chapter is all about introducing Max’s life. Players are given plenty of opportunity to interact with each of Max’s classmates and explore her surroundings. There’s possibly more ephemera to be read on the billboards posted all across campus than there are branches of dialogue to be had, helping to make the fictional Blackwell Academy and the town of Arcadia Bay realized locations. One of the things Life Is Strange gets right about teenagers is that they are the absolute best at wasting time. The game builds in several spots where Max can just sit and chill out. Playing guitar in her dorm room, reflecting on a child’s swing, or just resting under a tree, Max and the player can hang out indefinitely without a care in the world. Zoning out, overthinking your response when the cute skater boy asks you a simple question, having authority figures distrust you just because… this is exactly what being a teenager feels like. Everything is out of your control and you’re just grasping for what little agency you can. These are seemingly innocuous points that add little to the action or plot, but they are tremendously important for making Max’s story feel real. But those imperfections are no more than blemishes on the game’s oily adolescent face. 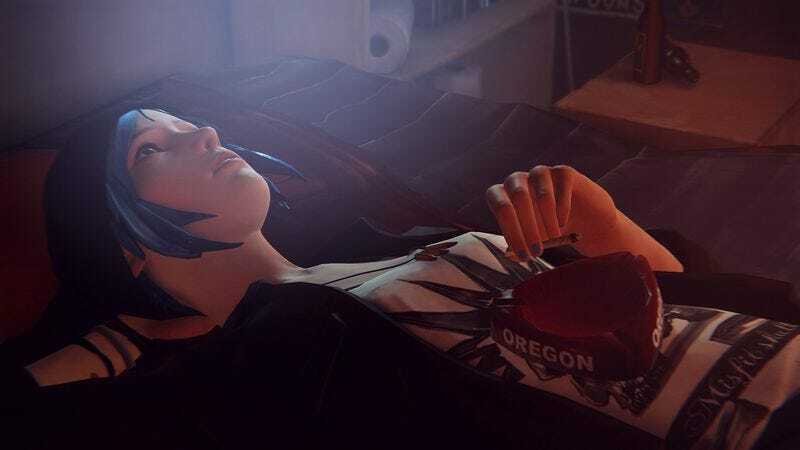 Life Is Strange wears its influences like so many 1-inch badge pins, and while it covers a lot of familiar territory, this first chapter never feels especially derivative. Upcoming chapters promise more action and excitement, but “Chrysalis” has already given me something I didn’t expect: a representation of modern teen life that is neither romanticized nor condescending. Just as a chrysalis is the transitional stage in a butterfly’s growth, Life Is Strange knows that teens are just humans in transition.